Book 6 in this highly addictive series starts fairly joyfully for our heroine Ava Lee, debt-collector and forensic accountant. She is attending the wedding of her half-brother Michael to Amanda Yee. But, as so happens in her world, moments of happiness come few and far between when there is a case heading her way. It seems an investment with a furniture company in Borneo, run by two sisters, that she and her business partners, May Ling Wong, and Amanda have put money into, isn’t paying off, there’s fraud, bankruptcy, and perhaps even a little revenge involved. But not only is there that, Ava’s personal life is entering rocky territory, Uncle’s diagnosis is dire, and she and his bodyguard/driver Sonny, and his housekeeper, Lourdes are all preparing for the worst. Her whole life is thrown into upset, and things are about to get worse. Taking a two-day jaunt home to Toronto to catch up with her mother Jennie, and her girlfriend Maria, Ava is shocked to hear that one of the sisters and Amanda were attacked and beaten, and Ava sees a connection between that and a lawsuit and investigation she’s begun on the company in the Netherlands. Travelling to Borneo, Ava finds herself taking on thugs, and ends up in a position that she herself has put many people in through the past novels, and it’s a dark twist, but there may be one last glimmer of hope for her. With each novel, especially read in one big go as I have (though I can’t really be blamed for that, it’s Mr. Hamilton’s fault for making them so addictive, firing my need to know what happens next), the emotional resonance grows deeper, the characters evolve, and these past two novels have gotten decidedly a little darker in their events. But it may just be that way to me, because I’ve read them all back to back. Ava remains a smart, resourceful hero, and Hamilton has found the perfect balance between character, detail, plot and pacing, so much so, that late into the night, it’s always… ‘just one more chapter.’ I love when a series of books grabs my so viscerally and just drags me along for the ride, I’ve been living with the character for a few weeks now (despite the fact that I’m only posting 1 book review a week, I’ve actually flown through the entire series in maybe half the time) and I can tell you right now, I am going to be going through serious withdrawals by the end of the next novel, as its follow-up isn’t due until February of next year! Still, 6 books in, this is still brilliant fun! 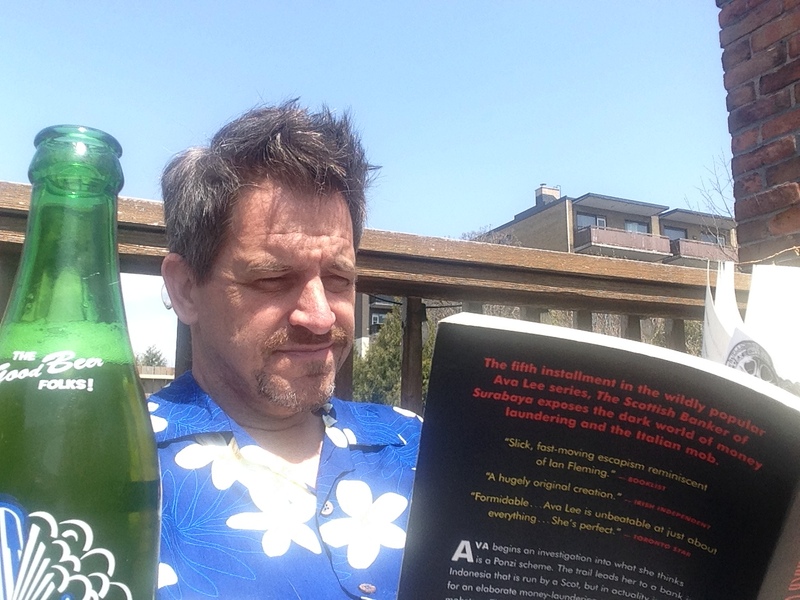 And I’ve said it before, and I even posted a picture to back it up… this is the kind of book you want to rest on your patio with, feet up, beer in hand, sun on your face, and a great Canadian book in hand!